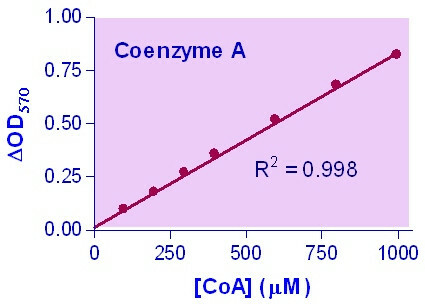 For quantitative determination of coenzyme A (CoA) and evaluation of drug effects on CoA metabolism. • Sensitive. Use 10 μL samples. Linear detection range: colorimetric assay 5 - 1000 μM, fluorimetric assay 3 - 100 μM CoA. Coenzyme A (CoA) is involved in many important biological activities including the synthesis and oxidation of fatty acids, pyruvate oxidation in the citric acid cycle and many others. One of CoA’s most crucial roles is the carrying and transferring of acyl groups. BioAssay Systems’ method provides a simple, two-step and high-throughput assay for measuring CoA. 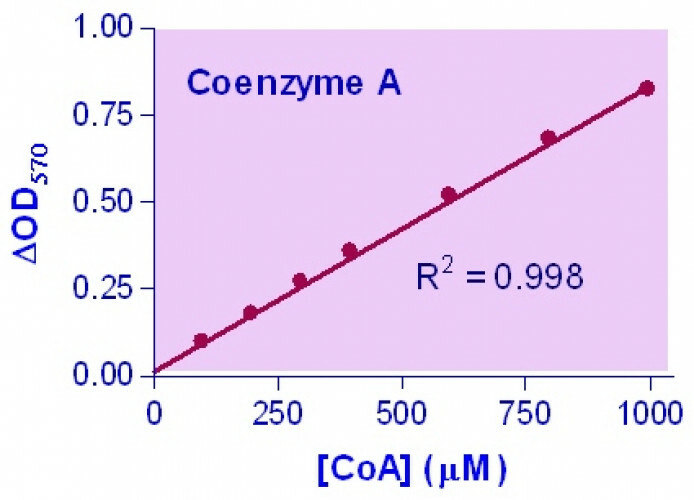 In this assay, the first step enzymatically converts CoA to acyl-CoA and the second step oxidizes the acyl-CoA producing an enoyl-CoA and H2O2. The resulting H2O2 reacts with a specific dye to form a pink colored product. The optical density at 570nm or fluorescence intensity (530/585 nm) is directly proportional to the CoA concentration in the sample. Applications For quantitative determination of coenzyme A (CoA) and evaluation of drug effects on CoA metabolism.